2 weeks ago, our picture was just up the street at the Sears service station. You can see the Heidelberg Beer sign. That old timer looks like he wants to buy a 2 seat convertible. The Mrs is shaking her head ‘no’. That should be Roger SAGNER’S. You can the ” Top of the Cosmo” sign there in the distance. my fathers sheet metal shop, Hanset Sheet Metal, was one block west on Grand. Yes, that was Sagners. I block east was House of Hardtops. 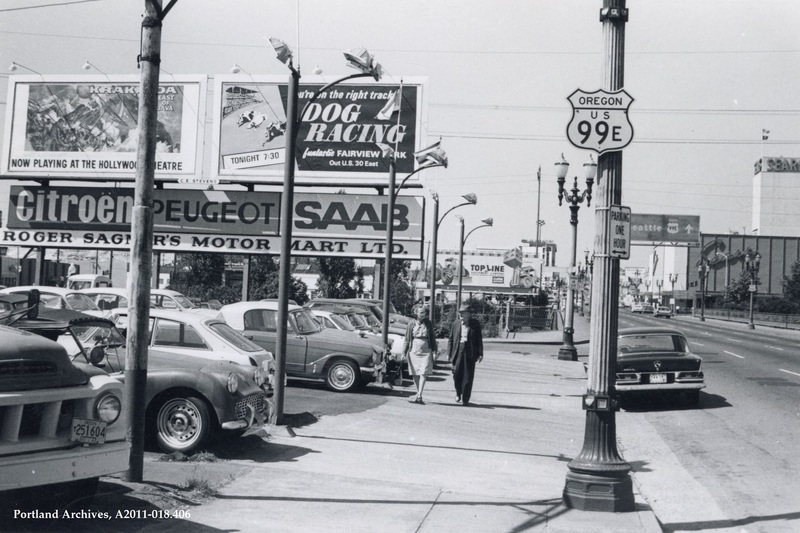 Immediatily behind Sagners, on the east side of Union, was Sam’s Cadillacs. Yeah Jim, I had my VW Squareback engine overhauled in “The People’s Volkswagen Works” (or some such name) right after your father moved his shop. The Sears Building in the background is now the Metro headquarters remodeled by Bob Thompson and Tom Cole Architects in 1989. I remember you would get blotto after work in the sheet metal shop at dive bars on Grand, you are a legend. Jim Hanset, you are a legend on Grand Ave. You sure could knock them back in those days. The Sears building in the background is now Metro’s Headquarters. Bob Thompson and Tom Cole Architects remodeled the building for Metro in 1989. Just to the east was the Harley Davidson dealer, George Shantin’s East Side Motorcycle. I remember Al Stimac, Paul Frank and John Martinolich “The Oregon Rocket” of motorcycle hill climbing fame. Love the billboards: Krakatoa, East of Java and a greyhound racing advertisement…. You are correct about the Harley shop. Do you remember the shop had single cylinder hydraulic lifts for each bike, built into the floor. You could see them in the raised position from the large picture windows at the front of the shop. It was impressive. Looks like there was a great selection of English two seater, rag tops at this dealership. Early 60’s Austin Healey ‘Sprite’ or MG ‘Midget’ were my favorites. That one in the foreground, a 1960 Triumph TR3A looks to be in fairly decent shape. Wish the other rag tops were distinguishable, further along. I enjoyed all the comments from you Portland “locals”, they were great. I grew up right here. All my youth, aside from school, was spent at my fathers sheet metal shops. Before he was on Union, he was at 5th and Davis, NW. Across the street was a “gypsy gambling joint” as dad described it (he loved the place), and the upstairs of his shop was a house of ill repute. I have pictures of the location. Dad rented from a Jewish man that we loved , as he handed out hard candy to all us kids when he walked through the neighborhood. Dad moved from Davis to Union in 1954. Jim and Kenn et al, thanks for taking us back on a walk through a rockin’ old ‘hood along 1960s Grand Ave.; kind of a walk on the wild side! I can almost hear those bikes revving up and Tom Jones wailing out “What’s New Pussycat?” in the background. OK! Roger Sagner missed the boat by passing on VW. He spent the rest of his life attempting to sell minority vehicles and never quite succeeded. A great person and a good salesman but could not connect with the right product. Roger Sagner had a tagline of “Funny Little Cars for Funny Little People” for some while. He never seemed to take himself particularly seriously, and he was without a doubt a funny little fellow himself. In the mid to late 60’s English cars such as the apparent Triumph’s and MG’s were not so far from the mainstream, but his lot was the place to go if your tastes tended more toward the Citroen, Peugeot and Saab vehicles that his sign advertises. He had a bright red Formula Saab in his “showroom” that was an open wheeled single seat race car with a 2 cycle Saab engine that I yearned to own as an 18 year old fledgling motor head. In 1976 I purchased a 1955 Citroen 2CV and a 1970 Citroen DS 21 Pallas from Roger Sagner. And I almost bought a new Peugeot diesel sedan that was in his stock. Roger Sagner was NOT a “little fellow” as stated in the message above. He was tall and husky and around 235 pounds. You can find a video of Roger Sagner at Youtube here at the link below. After I got a full time job I bought my first car from Roger in 1969. A new model Saab 99, British racing green(or close to it). I was into smaller foreign cars at the time, not the big gas guzzling big cars that were popular. I was looking very seriously at the BMW 1600/2002 at Hoffman Motors but Roger, ever the salesman, talked me into the Saab because of its features like the fold down back seat and free wheeling. Plus it could seat 4 people more comfortably. Little did I know that it had British Triumph engine. Kinda wish now I bought the 2002. Wow ! never recognized that corner without its homeless camp. When I was in either 8th or 9th grade a friend and I would play hooky, maybe indulge in some smokes (both kinds) and spend the day at that Sears playing pinball. I was there at least twice a week without even a question from the employees. A different time I guess. The machine was not more than 15 feet or so from the West entrance. I still remember the game, it was called “Flip Flop” and it had a western theme.